Padma: First of all thanks to "Simple Indian Food" for featuring in their series 'Super Blogger Sunday". I am really honored. I was born and brought up in Bangalore, Karnataka. Mother tongue is Telugu and native near South Tamilnadu. So was exposed to cuisines from all over these places right at home. I am a home maker with two kids. Cooking is my passion and always loved collecting recipes from magazines, TV Cookery show and noted them down in a book. Later noted down many recipes from mom and grandma. That book was in great demand right from college and was always under circulation. Luckily was able to get them back by the end of college. 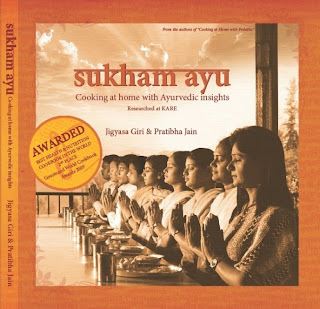 Sukham Ayu - Jigyasa and Pratibha's second venture after Cooking with Pedatha won the second place as the Best health and Nutrition book in the world during 2009. It is a perfect book for a layman to incorporate ayurveda in the day to day food. There are more than 60 vegetarian recipes classified in different categories that are simple to make and nutritious at the same time. So the reader can look forward to Nutritious, tasty and simple recipes in the book. Mix the oil in lukewarm milk for the dough. Beat well and add it to the mix of flour, baking powder and salt and make a soft dough. Knead well and keep covered for 10 -15 minutes. Make balls and roll them into medium thickness rounds. Heat the tava and cook these rotis in medium flame till brown spots appear on both sides.﻿ Repeat for rest of the dough. Mix the ingredients of filling well and place a little on one side of the roti. Roll tightly. Keep a paste of the flour with little water handy and apply it to bind the corners so that the filling doesnt come out. Cook on the tava for a minute more so that it binds well. Hello everyone. I'm Zenobia. I'm born and brought up in Mumbai and work as a writer at an eLearning company. In my free time, I run a blog on raw vegan foods. I'm 100% vegan, and try to be as raw as is humanly possible. Coming from a largely non-vegetarian eating community in India, I've always had an uneasy relationship with meat. I knew it was bad (for a lot of reasons - You take your pick), but was too lazy to cook my own stuff and continued to go with the flow. But as I watched more and more food documentaries that are critical of our current food production practices, I finally decided to get off my behind and put my money where my mouth is. I have always been fascinated with food - but from a distance. I loved watching people cook on TV or staring at photos online, but cooking really didnt seem up my ally - Until recently. Well, I still don't cook much. I prefer things fresh and quick to put together. So, my menus feature heavily on salads, and easy to put together meal ideas and recipes. And, since I have not been trained in cooking, so to speak, I love mixing seemingly odd flavors and foods items. My philosophy about food is - try it, what have you got to lose?! If it doesnt taste good, throw it and start all over. Hope you all will make the time to visit my blog and give me your blessings. 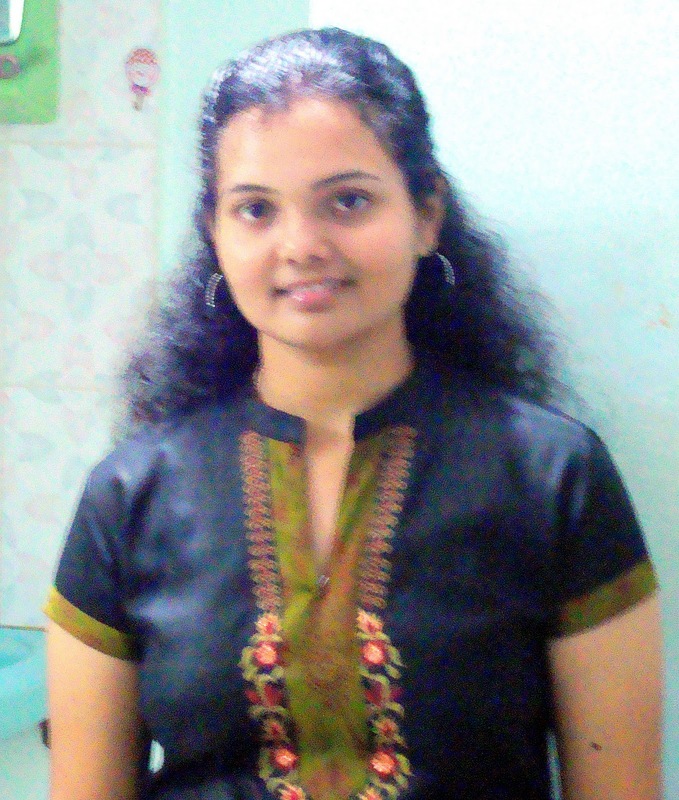 Laavanya: I'm Laavanya, currently residing/working in the US and originally from Madurai, India. We (my husband and 2 kids) enjoy food and my daughter in particular loves to help me cook/bake. Food has always been well appreciated in our family and both my parents are wonderful cooks. I've always had an interest in cooking from an early age but got to develop it only after I turned 20 and found out that I love cooking & trying out new recipes. Initially I had just one blog (started June 2006) that chronicled happenings in our life & my daughter's growth and gradually I started to incorporate food related posts in that. After getting acquainted with the large food blogger community, I created a separate blog for my recipes (started June 2007) and transferred the previously published posts to the new blog 'Cookery Corner'. I thought that it would be great to have a online repository of my recipes (which was initially in a file box).. I'm thankful because my blog has given me a lot of good friends in the food blogging world and so many awesome ideas & recipes that I've incorporated. The frequency of my posts has reduced considerably over the last year or so due to time constraints, but I intend to post as often as I can. Most of the time, what I post, is either part of our standard meal or something new I tried out... only rarely do I cook specially for the blog. Mix the ingredients of the stuffing and keep aside. Sieve the flour, soda and baking powder together thrice to ensure even mixing. Transfer to the mixing bowl and make a hole in the center. Pour the milk, sugar, salt and curd in it and mix after a minute softly to make a dough. Keep aside for 3-4 hours. Make medium sized balls of it and dust it with the flour. Roll into thick chapati, place the stuffing in the center and close it well. Dust and roll gently in the shape of a naan. Apply water on one side of it. Stick this side to the tava and cook covered for 1-2 minutes. Bubbles will start coming up on the naan. Slowly invert the tava and expose the naan directly to the gas flame and cook on the other side as well. When brown spots start appearing and the naan is cooked, remove from the tava and apply butter as required to it. Alternatively you can even cook it on the tava alone till you get brown spots on both sides. Serve hot with a spicy gravy of your choice. Meet Divya Kudua of Easycooking as a Super blogger this sunday. She has more than 400 recipes posted in 3 years time. The main attraction in her blog is more than 100 baking recipes and collection of Konkani recipes..Her style of posting recipes with step by step pictures makes it much more easier to follow ..Read more about her.. I love cooking, trying out new recipes. I have 2 kids who are quite fussy with food which pushes me to try out new recipes to interest them. I have been browsing different recipe blogs for the past 1 year and have just started my own blog since last month (December 2010). Though i try out different cuisines, I have updated my blog with only those dishes whose recipes are passed down from my mother, mother-in-law and my aunts. Once I exhaust with all these recipes, I shall update the recipes I try out sourced from the net. I'm from Bangalore, hence I know to prepare traditional Karnataka recipes, which I update in my blog as and when I prepare them, which is quite often. Other than than, since my roots are from Andhra/Tamil nadu border, I have been taught to prepare Andhra dishes as well. So, my blog contains Karnataka, Andhra and Tamil nadu cuisines. I have used simplified methods and short cuts in most of my recipes since it is easier when managing 2 school going kids. Please go through my blog, feel free to put forward queries if any and you are welcome to put in your suggestions and advice in it. Looking forward to meet you on my blog. Make a soft dough of all purpose flour, salt and water. Add oil and mix well. Keep covered for atleast 1 hour. Heat 1 tsp ghee and add the grated beetroot. Mix well and cook on low flame till beets are cooked. Add sugar, cardamom powder and mix well till sugar melts. Cool well and make 3 small balls of it. Grease a plastic sheet with little oil. Take 1/3 rd portion of the dough and pat it on the sheet by covering it with another sheet. Let the center be little thick and sides thinner. Place the beetroot stuffing in the center. Cover it with dough from all sides and again pat it keeping another plastic sheet on it. Pat slowly ensuring the filling does not come out. Heat tava and cook it on medium flame with little ghee on all sides till brown spots appear on both sides. Serve hot with little more ghee. ** You can even grind the beetroot before frying in ghee. ** Since beetroot is already sweet in nature, remember to reduce the quantity of sugar. Chitra from Ratatouille- Anyone can cook is this week's featured super blogger. With a little more than 130 recipes in two years, you look for nice pictures and good variety on her blog..And the highlight is the "Kitchen clinic" series..Read more about her..
Chitra: First I thank EC for giving me this renowned title & a chance to tell about myself to this blogging world. I am a home maker with cooking as passion & avocation. Before my marriage, my lovable mom never allowed me to enter the kitchen. So I cooked only at exigency and that too very simple dishes. After my marriage, to my luck I've got my MIL equivalent to my mom who never enjoined me to do the house holds. I learnt and did everything out of my own interest and slowly started cooking. Now iam a full time cook experimenting all the dishes of my MIL & MOM for my caring partner. Also I am the mom of a 4 yr old cutie who keeps me occupied round the clock. I started my food blog on the eve of new year 2008. Its just completing its 2 years. As everbody says I too consider this blog as my diary / record of recipes for which I get good results. Sometimes I try some recipes from other blogs and I treasure them in my blog. Nowadays I am not blogging actively like before due to some personal reasons. But I make sure I post atleast 2-3 recipes in a month. 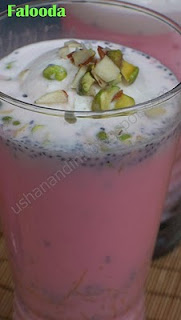 I am doing my best to post more n more recipes in future and planning to do some changes in the way I present my blog. Other than blogging, I have interest in reading magazines , shares & MFs. Chitra: My husband is the sole responsible & motivation to start my blog. He suggested me this catchy title & taught me all the technical basics. Whenever I want to try some new recipes, like u all I too go for the google search..One such recipe I wanted to try was gongura thogayal which I got from srivalli's blog. From then I started to visit her blog for various recipes and tried at home. So I should say her blog is also an important factor to start my own. Thanks a lot srivalli for being my inspiration :). One more person I should mention at this point is my SIL..I dont want to say much about her blog. Its name says the fame.she shared me some useful tips in photography. Chitra: Blogging has improved my cooking skills, came to know different cuisines and above all it has fetched me so many encouraging friends. EC: Which is the dish that is a hot favourite among ur family and friends..Any cuisine or recipe that you have been wanting to try since long. EC: What are the sources of your recipes..Do you follow them as it is ?? Chitra: Most of the recipes are from my MIL & MOM. Other than this I try the recipes of my friends,cookbooks & blogs. I cook & blog all the recipes that suits my family's taste. I adjust the quantity of ingredients given by others especially the spices. Chitra: No, to my knowledge nothing have been copied without my permission. Of course plagiarism is an offence. Its like stealing others hardwork. But if i find anything copied from my blog , I dont feel angry or tempestuous. I think its of no use. Anyway once copied is copied. I convince myself saying somebody likes my recipes and I had helped them to get name & fame. 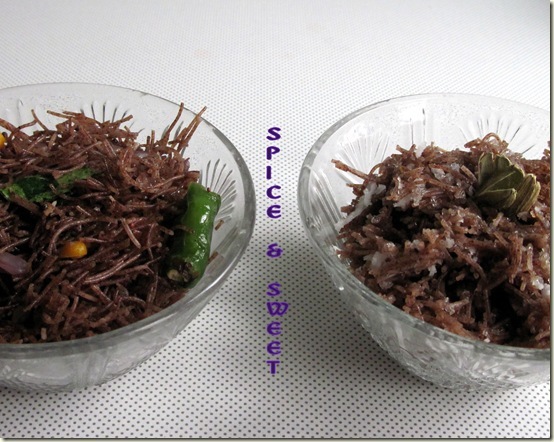 Chitra: Our favorite recipe is Ragi vermicelli - Sweet & spicy version. My hubby hates ragi but he loves to eat this vermicelli at anytime. Meet Shilpi of It is tasty Ma ! blog in the budding blogger series this week.. I was born and brought up in Bombay, India; journalism happened to me almost by accident. It was not a career that I had planned or even wanted to take up, but once I got into it I enjoyed it immensely. Food and travel was a source of joy, something which I enjoyed during my leisure time. I also had the good fortune of doing restaurant reviews during the course of my career as a journalist. Therefore, some years back when I gave up journalism and I began to miss my first love - writing, I decided to take up food blogging in August 2010. After all it is an excellent way to combine my first love -- writing -- with my source of joy—food and travel. The inspiration and the star of this blog is my mother. She is a passionate cook and still very active in the kitchen. We are Bengalis so obviously Bengali cuisine is what you would find on our dining table but my mum not only enjoys cooking but also likes to experiment with other cuisines as well; some of these recipes are also featured in my blog. Besides recipes I will also take my readers on a culinary journey as I try different kinds of delightful food both in Bombay as well as other towns and cities. Heat 2 tbsp ghee and roast the oats well. Add 3 cups of water and cook it. Keep seperately. Pressure cook the dal seperately till soft. Heat the jaggery with little water and after it melts, strain it to remove the impurities. Heat it again and allow it to get thick. Add the dal and cooked oats to it and mix well. Cook on low flame for few minutes so that the jaggery taste gets mixed well. Roast the cashews in the remaining ghee and add it along with cardamom powder and edible camphor. Mix well. Switch off the gas and allow it to cool a little. Finally add the boiled milk and mix well. Ensure that you add it when it is in room temperature or else it will curdle. 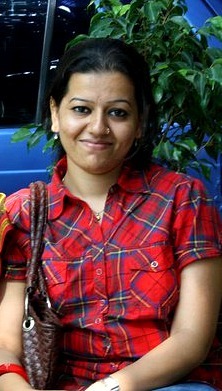 Meet the talented Nandini of Nandini's Food page in the Super blogger series. She has tried various regional as well as international cuisines. The blog is nearing almost 500 recipes in a little more than 2 yrs of blogging. Nandini: First of all, thank you for choosing me for the interview and I’m really honoured. I am an ‘at home’ mom of two beautiful kids. My main passion is cooking healthy and tongue-tickling dishes. I’m obsessed with other activities like reading novels of the real-life and fiction genre. But ironically, my life is like that of one for I never have time to myself and have to help my children in their homework and busy with other work. My initiation of blogging was in September 2008. At first, I started blogging my recipes on the net to share my family’s tastes with the rest of the world. Then I saw that there was a large group bloggers on the net publishing their recipes. I also found myself getting involved with other Indian food bloggers. I update depending on how interested I am and what my mood is. Nandini: I unintentionally (and accidentally) started blogging when my loving and caring husband suggested so. I developed more interest in pursuing diverse cuisines. EC: You have been blogging for more than 2 years and nearing almost 500 recipes. Do you cook specifically for the blog? What are your plans regards your blog for the coming years? Nandini: Precisely. On most of my posts, the photos and recipes are either actual lunch or dinner. Sometimes, I do cook specifically for the blog keeping my family in mind. Some of my recipes were learnt from my mom and some from huge collection which I’ve accumulated over the years. I plan to post more diverse recipes for the coming years after racking my brain. EC: Do you think blogging has widened your perspective and exposure? Nandini: Absolutely. Blogging has changed the way we gather information. It helps you gain new techniques and understand food culture from fellow bloggers. EC: Have your recipes or pictures been copied anywhere without your permission? How would you deal with plagiarism? Nandini: I had been a victim of plagiarism once in the blogging world. I got over this problem and considered it a common act happening ubiquitously. Obviously, the best way to deal with this problematic nuisance is to take necessary precautions like watermarking, copyright etc. EC: Have you encountered with something interesting after you started blogging? Nandini: Interesting…Yes. There have been a lot of incidents. One of them involved my husband. My husband never mentions my blog to his friends. One day, I posted a cupcake recipe. That particular day was my hubby’s b’day. One of his friends was surfing through my blog without knowing it was mine in the beginning. He saw the date I posted the recipe and H’s b’day date. To confirm himself, he asked my husband, “Is this your wife’s blog? How was the birthday cupcake?” Then my hubby replied that I’m running the blog. This was one such interesting incident that I experienced. 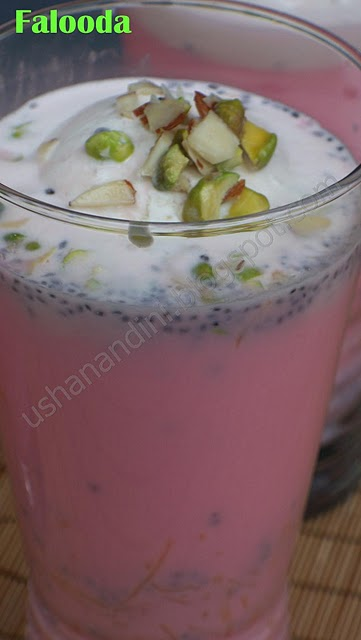 Nandini: My favorite recipe is Falooda which I always love to guzzle. But not in this bleak season. I made my own Vanilla ice cream recipe which I actually forgot to mention in the post.